Last month the most widely shared things on my Facebook page were a recipe for toad in the hole and a story of woe about a bloke who put popping candy on his todger. One of my readers even wrote to me, confiding that her husband loves a thick sausage. Turns out that you lot love a good snag too! 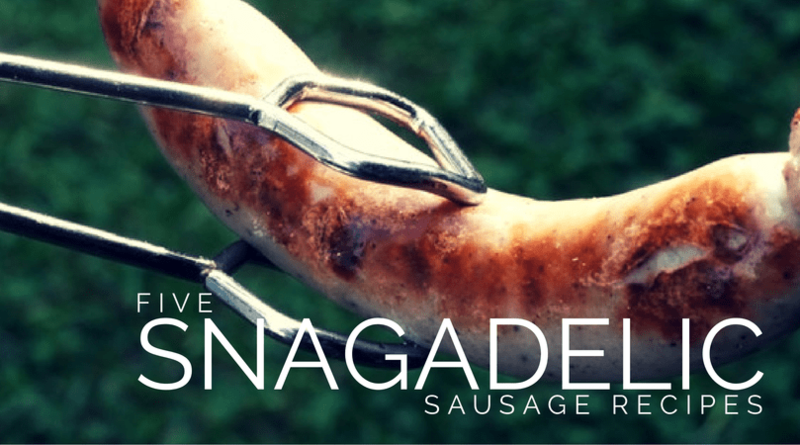 If I’ve learned anything about this blogging caper, it’s give the people what they want, so I’ve hunted five snagadelic recipes for sausage lovers! This recipe is so good, the internet is swimming with imitations. As far as I know, this is the original. I’ve made it and it falls in the “evil genius” category. Ridiculously delicious! What do you get when you combine snags, pasta and soup? The liquid equivalent of Baby, it’s cold outside! I’m often late to the party, so it should be no surprise that I’m the last person on earth to discover Two Peas and their Pod. They welcomed another pea just last week and he’s adorable! Jay, the Moodie Foodie herself, is a friend of mine. Her site is full of recipes designed to scratch your itch without expanding your waist line. Trust her to concoct a healthy version of bangers and mash! The $120 Food Challenge is an Australian blogging icon. Every fortnight Sandra shares seven main meals, 2 desserts and 1 cake/slice for the total of just $120 per week. Her frugal approach to cooking has earned her an army of followers, a swag of awards and even a cookbook. This recipes for baked Italian snags serves four people for just $7.75! Babymac takes beautiful photos, tells great yarns about her life in the country and gets to say the f-word as much as I would like to (perhaps she’s a grown up). Her recipe for sausage pasta has all the kid-pleasing elements (sausages + pasta) with a few parent-pleasers (hidden green stuff) thrown in too. Winner! what’s your favourite sausage recipe? I have no snag recipe – bbq or in a roll. That’s about it. I’m impressed you know so many! Good timing on this one. I opened the freezer this morning and all I had left was a lonely tray of sausages, which are now defrosting, and I was wondering what to do with them. I do a mean deviled sausage with mash! Must try some of these! Got to love a good snag. I’m doing a new recipe over the weekend for a spanish-style chorizo and sausage casserole. Said with appropriate lisp of course. Chorizo, bacon, porky goodness in general! I hate to admit it Amanda, but sadly my favourite sausage recipe is done by Bunnings! You really can’t beat a good sausage sizzle. I’m quite partial to just a great snag on the bbq and some yummy salad, but we also love cabanossi chopped and cooked on the bbq or saucepan, it’s yummo! Oh I can fee the summer coming. I have one sausage a year on Australia Day since I’m supposed to be a vegetarian/pescatarian but those recipes are making me crave SAUSAGE! Your Austin Powers inspired tithe drew me in, but the recipes made drool!! My boys would love all of these and I would feel line I’d been a but creative with dinner. Winning all round baby!! Hubby loves chorizo sausages but also being a country lad loves deviled sausages! !